Rich Cavagnaro, President of AdEdge Water Technologies, and Tom Carmody, President of TC Tech LLC, share how their companies have partnered to successfully grow business in the advanced water treatment technology space. Water Online Radio: Rich, give us a quick rundown of AdEdge. How do you serve your market? Rich: We design, sell and install water treatment systems for a variety of contaminants. Arsenic removal is one of the main things that we handle, and we’re primarily focused on municipal and wastewater markets. Water Online Radio: Tom, give us a rundown of your organization. What do you do? Tom: We are a local distributor. We distribute products for advanced treatment technology, including Rich’s products and products for about five or six other “best in class” manufacturers. Water Online Radio: Rich, what is the importance of a representative firm (rep) for an organization like AdEdge? Rich: We had a great year last year, and we’re growing very strongly this year. As we continue to expand, the ability for us to be as present in the marketplace becomes more challenging for our own staff. So, we have put a reliance on growing our business through our rep network. They know our presence in the marketplace, they have the local relationships, they have other lines which are complimentary to perhaps projects that we are trying to do as well. So it is a nice synergistic fit for us to be able to rely on those guys locally in the marketplace and grow our business with projects that we may not even hear about in Atlanta. 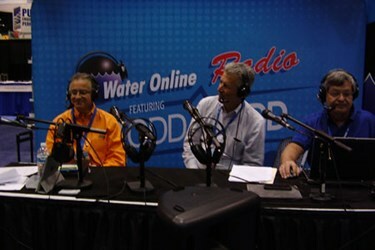 Water Online Radio: Tom, what is it about AdEdge that is valuable to you and what do you expect from AdEdge? Tom: What AdEdge brings is technology and knowledge in specific areas. Of course, we are also focused in advanced treatment technology. AdEdge has gained recognition as the best in arsenic removal, and then expanded into multiple other technologies. Water Online Radio: There is a big issue in the marketplace when it comes to mind share. As Tom said, you represent six or seven different organizations. What kind of steps do you have to take to be sure that Tom is up to speed on what is going on and educated about how to effectively sell in the marketplace? Talk about the work you had to do to maintain that relationship and be sure that Tom is in the best position to market your product. Rich: One of the main things is having a rep firm with fewer line card items of companies that they represent. If they have 20 companies, then we are 5% of that line. If a rep firm has fewer companies to counsel, we can get more attention. From our standpoint, we are responsible for delivering timely responses, proposals, and making sure we deliver the product as they need it. Oftentimes we might not understand the timeline of a project and multiple things that they are trying to coordinate with that customer. Solid communication is important here. When we bring new people into the company, getting them to recognize the needs of the rep firm is important, and it is a big part of our training process. Water Online Radio: Tom, describe the ideal customer for TC Tech teamed up with AdEdge. What are the issues that you can address best through this partnership? Tom: It is anywhere from a home-type market to an industrial market, to a municipality. We recently sold a small school over in Pennsylvania where there was an arsenic problem. We sold them a 20 gallon a minute system to take the arsenic down from 20 parts per billion down below the threshold of 10. We’ve also worked on entirely different projects such as for McGraw Hill, a very large company with a $500 million dollar system for their total data management. They needed water treatment for their cooling tower and added supply. Also, the iron removal system for the cooling tower was mission critical.